This paste is very popular with our customers. 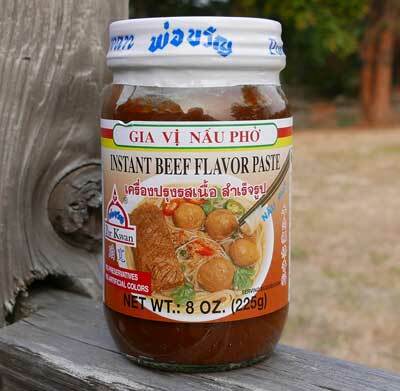 The flavor is rich, and the soft paste is easy to work with. A simple way to enjoy an exotic, full-flavored noodle soup. As shown in pictures below, which we made in our small motorhome kitchen, we demonstrate how to use this with excellent results. Start by placing some chicken (drumstick, wing, something with bones) into a saucepan and bring to a boil. Then promptly drain the water and rinse the chicken. With chicken in the pot, fill with clean water and bring to a boil again. Turn down temp to a simmer. While simmering, add a few drops of fish sauce (optional), a quarter of a shallot or yellow onion, a bit of salt, and crushed black pepper. After simmering for half hour, add about two teaspoons of Pho Flavor Paste and stir well. Separately, boil water and cook some chantaboon rice stick, set aside. Thinly slice fresh beef (such as flank steak). Slice fresh green onion. Place sliced beef into a bowl and Ladle the hot pho soup over it, Add cooked rice stick and stir well. Top with sliced green onion and a sliced Thai chile if you have it on hand. Serve with a litlle dish of Hoisin Sauce on the side. As you eat the Pho, dip meat and/or noodles into the hoisin before eating it. Hoisin adds so much enjoyment to Pho. You'll love it! Ingredients: Onion, soybean oil, salt, garlic, water, sugar, beef flavor, ginger, cinnamon, sweet basil leaves, star anise, msg, citric acid. Packed in an 8 oz glass jar. Product of Thailand. From customer Christine in Gaithersburg MD. I am a real fan of the Pho paste...I can't image ever trying to make the real thing myself, but this is so darn close, especially if you through some star anise in while it is simmering...I have bought it for friends who are huge, but finicky Pho fans and they too have been pretty impressed. We also offer Mama instant pho noodle soup.